The resurrection shouts truth with certainty. “That you may know the certainty of the things you have been taught.” Luke 1:4 NIV. You probably try not to think much about death, until something happens that does not allow that luxury. It seems more pleasant to ignore that undesired eventuality as much and as long as you can. But you are mortal; no matter how you suppress your feelings or disguise that fact. No one lives forever. And death is that unavoidable reality; you just don’t know how or when. Until Jesus returns, the Psalmist’s words endure, “No one can live forever; all will die. No one can escape the power of the grave.” Psalm 89:48 NIV. Now that sounds grim, doesn’t it? Death is grim and unpleasant because it is unnatural to us. But there is good news. “That by His death He might destroy him who holds the power of death – that is, the devil – and free those who all their lives were held in slavery by their fear of death.” Hebrews 2:14-16 NIV. You were created to be eternal, in the image and likeness of your Creator. Sin introduced death, not God. Romans 5:12-19 NIV. The dread of death causes despair. That was true at man’s origin, and it is true now. Days earlier, harsh realities replaced dreams and hopes the Christ-followers held, challenging everything they believed about faith and the future. Despair shoved hope aside. They stumbled, ”back home,” back to life as it had been; to pick up what little seemed left – broken, bewildered, and discouraged. Things they thought possible before, seemed impossible now. Things sure to them days before, now posed troubling questions. You will face times when life is hard and you feel like turning around. You might ask yourself, “What’s the use?” Something will seem to have erased your future, but your future is safe and secure in God’s hands. Then came Easter morning! “All honor to the God and Father of our Lord Jesus Christ, for it is by His boundless mercy that God has given us the privilege of being born again. Now we live with a wonderful expectation because Jesus Christ rose again from the dead.” 1 Peter 1:3 NLT. Christ’s resurrection validates His power over death, proving that Jesus is the Lord of life, the conqueror of death. “God raised [Jesus] from the dead . . because it was not possible for death to keep its hold on Him.” Acts 2:24 NIV. Resurrection is the demonstration of God’s power, conquering your worst and last enemy; in comparison, everything else you will ever face is minor for God to do. How could we not celebrate such a supernatural and sacrificial life? Jesus said, “The things which are impossible with men are possible with God.” Luke 18:27. Luke thought it important to establish for others what he knew to be true, “Therefore, since I myself have carefully investigated everything from the beginning, it seemed good also to me to write an orderly account for you, so that you may know the certainty of the things you have been taught.” Luke 1:3-4 NIV. Easter is far more than a date on the Spring calendar, even more than a fact of history. Easter remains forever a current event, more relevant to your well-being than anything in today’s headlines. Easter makes sense of everything that has not made any sense at all. The empty Garden tomb made sense of the agony of Gethsemane and the cruelty of Calvary. 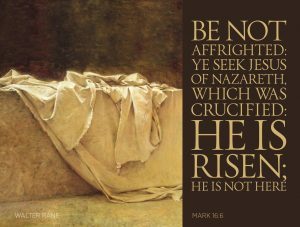 The Resurrection introduced possibilities beyond anything His followers had previously imagined when standing in the darkening shadow of the cross. Jesus’ birth, death, burial, and resurrection made impossibilities become possible. Jesus’ Resurrection shouts truth with clarity and certainty over every question, doubt, and fear. And Easter offers the same for you today. Jesus’ Resurrection guarantees yours. Death will not be the last word. Life is the final word spoken over you, life now and life everlasting. “Then the end will come, when He hands over the Kingdom to God the Father after He has destroyed all dominion, authority and power. For He must reign until He has put all his enemies under His feet. The last enemy to be destroyed is death.” 1 Corinthians 15:24-27 NIV. Meanwhile, God gives you the opportunity to live with wonderful expectation. Today I pray for you to live with certainty and expectancy that nothing is impossible with God. You only see when you take the time to look. Sight is an incomparable gift, not always given much thought and often taken for granted, until something threatens or lessens your ability. Think about it. So much of everyday life depends upon and is enhanced by your natural ability to see, perceive, and understand. That is also true of your spiritual life. For the Christians at Ephesus, Paul prayed that the, “eyes of your heart may be enlightened that you may know.” Ephesians 1:18 NIV.” Paul also wrote, “And we, who with unveiled faces all reflect the Lord’s glory, are being transformed into His likeness with ever-increasing glory, which comes from the Lord, Who is the Spirit.” 2 Corinthians 3:18 NIV. Too much of life is spent looking, often without taking the time to see with understanding. That would describe me in an art gallery or museum. I have wandered through art museums in San Antonio, London, East Berlin, Turkey, and even the world famous Rijksmuseum in Amsterdam, as well as the Musee du Louvre and Musee d’Orsay in Paris. How’s that for name dropping? Impressed yet? You need not be impressed. In each instance, I was more a tourist than a student of great art. In contrast to my casual perusal, I observed a young art student sitting, studiously examining every aspect of the the artist’s masterpiece, and faithfully sketching the painting that I had just glanced at for the briefest of moments. I admired, and then moved on. I looked. The art student looked, studied, considered, and saw what I did not take the time to see. I looked at the painting in general. She studied the masterful strokes of the artist’s brush with admiration. I lacked the interest and skills for the priceless work of art to fully appreciate the masterpiece before me. Maybe this is true in life and love; until you look with your heart, you cannot fully see with your eyes. I’ve heard it said, “Love is blind!” Instead, I suggest that love sees more than another’s casual observation ever will. Some look at the Bible and the God it reveals, and see only His demanding standards, without seeing His selfless compassion, sacrificial gift, and sufficient grace. Until you look with your heart, you will not see what is plainly there to see that God loves you; He really does. I find this to be true as well. If you’re not looking at all, you’re not likely to see what you need to see. Look for God in your everyday life. Look around you for His goodness in and from yourself and others. God appeared at the moment Abraham needed assurance of his future. Read Genesis 18:1-3 NIV. Are you at one of those moments? He is there; open your heart. “Abraham looked and saw . .” Genesis 22:4 NIV. Those few words suggest something that is of interest and for consideration. I know that the phrase, “looked up and saw,” could be merely an idiom of Hebrew or Elizabethan English for emphasis. Yet I am intrigued for this reason. Those simple words describe a bit of Abraham’s recurring experience of God. And they should describe your attitude of desire for spiritual life and growth. Abraham’s Godly curiosity and spiritual sensitivity demonstrate the price and place of being a disciple. The price is sacrifice. Read Genesis 22:4-8 NIV. Spiritual life is no casual stroll. There is discipline and commitment required. With sacrifice in hand, you meet and know God. A cherished friend often reminded me, and himself, “If it doesn’t cost you something, it is not ministry.” Abraham, “looked up and saw,” God’s provision that comes through obedience. Read Genesis 22:13-14 NIV. You will see what you most need to see when you are where God wants you to be. God invites you to meet Him in a place where you can know Him more fully, love Him sincerely, and enjoy Him completely.”While we do not look at the things which are seen, but at the things which are not seen. 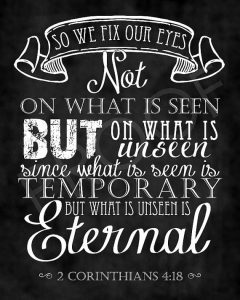 For the things which are seen are temporary, but the things which are not seen are eternal.” 2 Corinthians 4:18 NKJV. Change your focus and you redirect your life. Today I pray for you to cultivate a heart for God with eyes to see the wonder He is. Many things are prized; Christ alone is priceless. Priceless things do not always come with a price tag. Yesterday, I received a few digital copies of old family photographs. The originals from which they were copied were tattered by time, but immeasurably valuable to me. They were glimpses of our family history and heritage, my paternal grandparents, including my sister and I with our New York cousins. 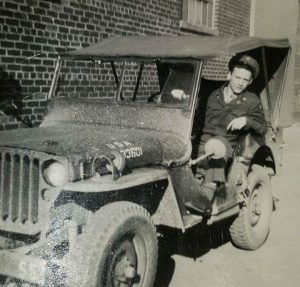 And a photo of my uncle Ralph, a proud marine who never returned from WW2. 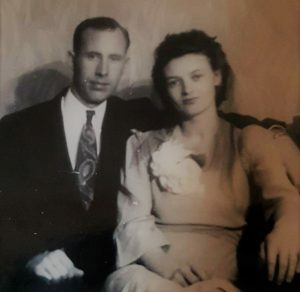 Another was of my parents as a young couple, apparently taken before I was born. And one of my sister on her first birthday. Those pictures would be noteworthy to no one other than our family and myself. But to me, they are priceless. Everyone has some things that hold special meaning tucked away safely or secretly somewhere. Such objects are rarely viewed as costly or valuable to anyone else. But to that one to whom they belong they are prized possessions. Usually, our valuable things are tucked securely in safe deposit boxes or may be paraded proudly and publicly before friends and neighbors as signs of our success, such as houses, cars, jewelry, college degrees, awards of recognition, expensive recreational toys, and things like that. None of those are bad on their own; none of them good enough on their own. The Apostle Paul listed many proud achievements about which he could brag and boast. “I once thought all these things were so very important, but now I consider them worthless because of what Christ has done. Yes, everything else is worthless when compared with the priceless gain of knowing Christ Jesus my Lord.” Read Philippians 3:7-8 NLT. Paul successfully checked off all the required boxes of religious, social, and political success. Those prized accomplishments identified who he was, how well he had done, and how important he was. But when he added it all up, he saw the inadequacy and emptiness of all that. “For it is not the one who commends himself who is approved, but the one whom the Lord commends.” 2 Corinthians 10:18 NIV. “Breathing out murderous threats against the Lord’s disciples,” Saul asked for and received letters of authority from the High Priest to imprison those troublesome followers of the recently crucified Jesus. Read Acts 9:1-5 NIV. While enroute to Damascus, Saul dramatically encountered the Risen Christ and viewed everything that he once counted as his life’s net worth, as worthless. Many things are prized; Christ alone is priceless. After his traumatic encounter with Christ, Paul’s singular, surpassing purpose became his passion to know Jesus personally and intimately. Paul wrote, “Everything else is worthless when compared with the priceless gain of knowing Christ Jesus my Lord . . that I may know Him and the power of His resurrection, and the fellowship of His sufferings, being conformed to His death, if by any means, I may attain to the resurrection from the dead.” Philippians 3:8-10 NLT/NKJV. While in college, “That I may know Him and the power of His Resurrection,” became my life-verse; it still remains so today. What prized possessions do you hold in a tight grip, or those that hold you in an even tighter grip? There are things that money cannot buy. Can anything at all actually compare with the true wealth of knowing Jesus Christ as your personal Savior and Lord? “Command those who are rich in this present world not to be arrogant nor to put their hope in wealth, which is so uncertain, but to put their hope in God, Who richly provides us with everything for our enjoyment.” 1 Timothy 6:17-18 NIV. Christ alone is priceless. Today I pray for you to allow nothing and no one to become as important to you as Jesus. “Let your conversation be always full of grace, seasoned with salt.” Colossians 4:6 NIV. Influence is best when its source is scarcely noticed yet its effect is significant. Jesus compared salt and light with influence. Salt is in almost every prepared food or snack that you eat, though you seldom notice its presence. Yet without salt, food can be bland, even unappetizing. But add too much salt and the taste of food is changed and significantly overshadowed. In its proper measure and proportion, the presence of salt is hardly noticed. However, when it’s lacking you detect its absence. Consider your everyday influence. Like salt, a person’s beneficial contribution to others’ daily lives may not be noticed until it is no longer being made. Influence is subtle. Influence is allowed, not imposed. Influence is best recognized in retrospect, yours and others. Typically, you won’t know the difference you’ve made until later, if ever. Others may not realize the difference you made until they notice your absence. When you purpose to contribute beneficially, you make a difference in others’ lives, as well as your own. However small your contribution may seem, or unnoticed it may be, contribute positively and deliberately without need for recognition or applause. If you make a difference in this world, it won’t be accidentally. Life is most meaningful and satisfying when you decide to live with purpose and deliberate intent. You are meant to make a difference. What you contribute – in your community, at your job, in your school, home, family, or friendships – has the power to help others and make others’ lives better, all the while fulfilling your own. Consider how that works. Stop working with the motive that others will notice your contribution and begin noticing and complimenting theirs. Taking people for granted comes a little too naturally. Many of those same people improve your life every day. A kind word to encourage can cheer someone on their way; a helping hand in a small or large task can make someone’s life better for the moment; a friend to share another’s journey is a welcome companion along the way. While you wait for your chance to make a big difference, you might be missing the very opportunities that let you make a difference now and will provide you even greater opportunities later. Start where you are. Use what you’ve got. Do what you can. Then you will make a difference. God’s Word provides good advice. “Let your conversation be always full of grace, seasoned with salt.” Colossians 4:5 NIV. 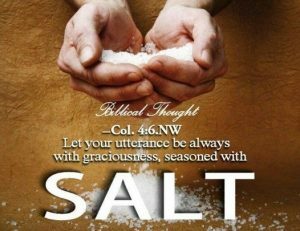 Jesus said, “You are the salt of the earth. But if the salt loses its saltiness, how can it be made salty again? It is no longer good for anything, except to be thrown out and trampled by men. You are the light of the world. A city on a hill cannot be hidden. In the same way, let your light shine before men, that they may see your good deeds and praise your Father in heaven.” Matthew 5:13-16 NIV. You were created, called, and gifted to contribute what is unique to your abilities, experience, personality, and opportunities. Salt in isolation does not make a difference, but when allowed to interact, salt enhances what is already there and supplies what is lacking. Jesus taught that you and I, as His followers, are supposed to be seed, salt, light, and leaven. Common to all of those is the potential of making a profound improvement. As such, you can make the best contribution and the biggest difference when you are willing to be where you are most needed, doing what you were best designed by God to do, with or without anyone else’s notice except His. Today I pray for you to contribute what you are and what you have to others. With God, life is not coincidental. Life rarely happens as you assume or expect. You may suppose that life will always reward you equitably for your efforts. And that is true to some degree, some of the time. But there are other times that the benefit you receive is not equal to the effort you expended. Occasionally, someone else gets the promotion that you thought would be yours, a reward which your efforts may have deserved. Bewildered, you are left to accept that it’s just not your turn or time for your dream to come true. That’s when you must affirm, “My times are in His hands.” Psalm 31:15 NKJV. Your life in Christ is providential not coincidental. Read the four brief chapters of Ruth’s story of God’s provision and grace. Everything must have seemed wrong to Ruth when her husband died too young and far too soon. At the death of their husbands, Ruth and another daughter-in law lived with Naomi, their mother-in-law, in Moab. Naomi apparently had little left after the years of famine in Bethlehem, and then the untimely deaths of her husband and two sons while in Moab. What could Naomi do except return to Bethlehem, and Ruth chose to go with her. Upon their return, what would they do? How would they live? As providence would have it, they returned in the season of harvest, but they had no fields to reap. They prepared themselves to live at the mercy of others’ kindness, but they soon found their needs unexpectedly supplied by God’s providence. As a kindness, widows and foreigners could glean what was leftover in the fields, but only after the reapers had gathered. What she brought home would be the meager result of her efforts. It wouldn’t be much, but it would be better than nothing. But unknown to Ruth, God had other plans. Soon, she would bring home what God would provide for her through the generosity of Boaz. As the owner of the fields, Boaz ordered his workers to leave, “handfuls of purpose,” for Ruth and Naomi. Little did she know at the time what God had in store for her and Naomi, just as you cannot foresee the grace and blessing that God purposes for you, to give you something extra, even more than you could have earned on your own. Often through the favor of others, God will bless you in the most natural but extraordinary ways. As God did for Ruth, He will place people in your path to help you have what God wants to give you. That is not random; that is God’s grace and providence. The Bible says, “Ruth found herself working in a field belonging to Boaz.” Ruth 2:3 NIV. She found herself in the field of Boaz – an opportunity neither coincidental nor merely fortuitous, but dictated by the sovereign providence of God. With God, life is never coincidental. Neither Ruth nor Boaz yet knew the significance of this, but God was directing her steps, and his. Her kindness to Naomi was reciprocated in Boaz’ kindness to her. Read Ruth 2:8-12 NIV. Ruth could never have foreseen the role that Boaz would play in her life. The Bible says the “steps of a good man are ordered by the Lord.” Psalm 37:23 NKJV. When you choose to trust and rest in the sovereign plans of an Almighty God, you will receive blessings, “given to you, good measure, pressed down, shaken together, and running over, [blessings] will be poured into your lap.” Luke 6:38 NIV. Plan for the unforeseen. Boaz instructed the men harvesting his fields, “Let grain from the bundles fall purposely for her.” Ruth 2:16 NKJV. One translation describes the process as, “handfuls of purpose for her.” Ruth no longer gathered mere leftovers from the corners of the field; she gathered what was purposely, providentially, and generously left for her benefit and Naomi’s provision. Today I pray for you to discover that God’s handfuls are ample and abounding.